Tourists have been around since people have had a curiosity about things, and places other than their own. In America, people began getting really curious when the railroad gave them quick access to other cities. Railroad tourism led the way to a more controlled, and customized tourism when automobiles began occupying the side lawns of American homes. With more cars on the road, the need for better built roads was obvious. The Lincoln Turnpike in Pennsylvania was the first road build for commerce, and tourism, followed by many others including the Wilbur Cross Highway (old Route 15) that ended here in Sturbridge. they had never been before. Niagara Falls, the Jersey Shore, Cape Cod, the White Mountains were all with in a day, or two's drive from home. Many inns at these destinations filled up with people out on their first explore about the country. The numbers of people traveling on the roadways led to a need of where to accommodate the excess that couldn't find a room at the inn. This led to the start of the motor court. Small, little motel like cabins along the route to wherever you wanted to go that offered a warm bed, and maybe a cup of coffee. These motor courts soon became motels, a combination of the words motor, and hotel. Now, travelers could not only drive to a destination, but find good lodging along the way. Sturbridge took full advantage of motor tourism with the east-west US 20 beginning to be built across country in the 1920's, and Route 15 as a north to south bringing people from New York and Connecticut to Massachusetts. Several Tourist Cabins, and motor courts opened on Route 20, and Route 15. People now had a direct routes through town, and places to stay as well as they traveled on to other places. The availability of those highways coming through town did not go unnoticed to those with vision such as the Wells family of Southbridge. The very same vision that built their American Optical Company to world renown drove them to purchase land in Sturbridge, along Route 20, for a place to build a museum to house their enormous collection of early American antiquities. Old Sturbridge Village opened for business in 1946 just when the automobile beginning to take families outside their neighborhoods, and towns, to parts yet to be discovered. Old Sturbridge Village prospered, and grew. Soon, there were numerous inns, motels, and tourist cabins in town along with restaurants, and shops to cater to the numbers traveling to town to visit the Village. Generations of people were first exposed to Sturbridge on a class trip the Old Sturbridge Village, and with those wonderful past memories, they took their own children back, years later, to relive those times. 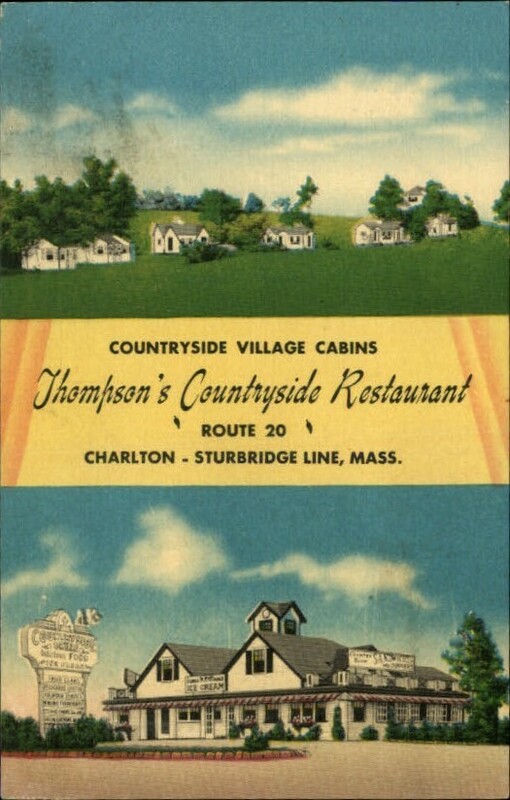 The antique shops in town, the speciality shops such as the Sturbridge Yankee Workshop, and restaurants prospered. During the late 1940's through the 1960's, and into the 70's, this was tourism in America. Williamsburg, Old Sturbridge Village, and the Worlds Fair were all on the itinerary. Load up the beach wagon, grab a new map at the Shell station to make sure the latest interstates that were being built would not be missed, and point the car in most any direction for adventure. In the early 70's it all changed. Walt Disney World opened to the public on October 1, 1971, and suddenly the destination on everyones wish list was Orlando, Florida. Hershey, Pennsylvania, Busch Gardens, Williamsburg, and Old Sturbridge Village became secondary "on the way to" or "on the way home" places to visit, and that was only if the tourists were driving. The next thirty years were were hard for many attractions along America's highways. Many did not survive as the mentality on family vacations changed to flying to a specific mega destination instead of hitting the road, and visiting several over a a week or so. Those that survived did so with not only great leadership, such as Jim Donahue, the CEO over at Old Sturbridge Village, but with a complete change of mindset in order to meet the needs of today's tourists. Jim Donahue helped rescue a floundering OSV, and brought it back on track. Old Sturbridge Village reconfigured itself in order to not only survive, but to succeed more than they had in the past. Leadership, team work, and a plan is what it took. In the meantime, the town of Sturbridge was still living in 1971. The Host Hotel has many conventions, and, although they bring large numbers to the hotel, only a few spill into the town. The annual Outdoor Exposition at the Hamilton Rod and Gun Club attracts great numbers as well, but they are interest specific, and I don't beleive many people come into town to shop the stores after the archery demonstration. The PanMass Challenge is a wonderful charitable event that comes to Sturbridge each August. The attention the town receives, and the numbers of people that come to our town are phenomonal, and unmatched, yet they come for a reason far greater than sightseeing -- those that ride have more on their minds than buying a primitive piece on Route 20. I am sure the restauruants, and shops do see an uptick in sales, as they do when the flea market in Brimfield is open three times a year. The shops, and restaurants do benefit by the numbers of people taking that same old highway, US 20, that started it all years ago, but it is not because we are a tourist destination, but rather a "a place on the way". And, there's the rub. Sturbridge is not a tourist destination, we have been demoted to just "that place on the way"'. Sturbridge does have a tourist destination within its borders at Old Sturbridge Village, but the days of making the town of Sturbridge the family destination for spring school vacation were 40 years ago. The times have changed, and those willing to see that, like Old Sturbridge Village, have embraced it, and planned for it, and have been succesful. Like any industry, a re-tooling is always needed every so often in order to upgrade the product. Sturbridge Fest, the Blue Grass Festival, was one such re-tooling. A new idea, totally unrelated to anything done here before. 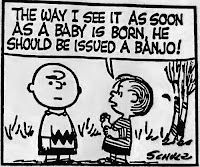 No historical attachement, no same 'ol, same 'ol, but a music festival, and a blue grass music festival at that. With the exception of the blue grass festival this past weekend on the town Common, there has been little success in attracting those "lost tourists", and that was because they were trying to recapture a past tourist, something that no longer existed. It is only when fresh heads came up with a new idea, did it gather acceptance, and momentum, and became a success. A new tourist was sought, and for that to happen, a new destination event was created. This took vision, the kind of vision that may once again make Sturbridge an actual destination, and not just someplace to grab a bite before heading south on 84 to NYC. The same vision, from fresh eyes, can help lead us to a better place for all of us, and not just for those new tourists we will be welcoming to our town. I see a welcome change a-coming story being written, and what better soundtrack could there be to this new story than a little blue grass music.